Adventure Calls Outfitters | Why Choose ACO? We do not view ourselves as owners of a product or service but rather as stewards of a gift to share with those around us. We provide scholarships to all of our activities for organizations that present a financial need. We also donate our time and provide financial assistance to various local charities, environmental organizations and ministries. Customer Service Excellence isn’t just a catch phrase here, it’s one of the basic principles that this company was founded on. It’s among the reasons why so many of our guests raft with us annually and why we’re on a first-name basis with most Group Leaders. We are meticulous about maintaining a professional yet personable image in everything we do. Equipment is upgraded on a consistent basis and we are constantly looking for new ways for you to have fun with us. From the time you make your first inquiry regarding an activity until you are in your vehicle heading back home, we will strive to make your experience with us the best possible. We have always asked more of our tenured staff and they perform at a higher level as a result. They are licensed by New York State, certified as First Responders or EMT's, and more than half are A.C.A. certified Swift Water Rescue Technicians. All of our paddle instructors are A.C.A. certified. Our river guide staff is the most experienced on each of the rivers we run, with a median tenure of 10 years. They utilize the latest technology to ensure each trip is run as safely as possible. Put all of it together and the result is our safety record being among the elite within the Paddlesports Industry. To learn more about our staff, click here. As the company that introduced rafting to Western NY, we were the first to commercially run both of the rivers we operate on. 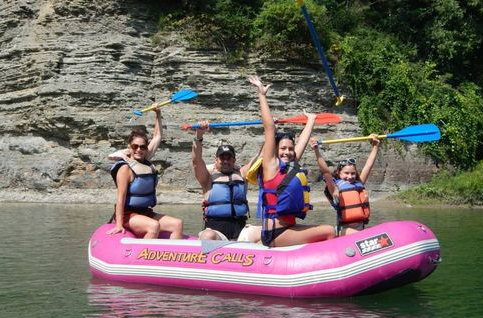 The Genesee River, within Letchworth State Park, is the perfect trip for novice paddlers and families alike. The Salmon River is everyone's favorite, providing an exhilarating whitewater ride on consistent river flows in the warmth of July and August. 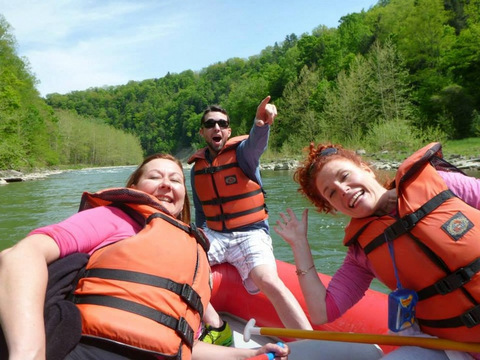 We offer lots of other fun outdoor adventures in addition to rafting. Whether you're looking for a romantic canoe dinner trip with that special someone, or some Gen-X High Adventure, we have a program for you. Read about all our special programs found throughout this year's newsletter. Read about all our special programs on the calendar page. Read what our guests are saying about Adventure Calls Outfitters.